Man Gives a Present to a Woman - Red Gift Box. Slow Motion. Slow motion shot of a young woman catching a gift box with her hands. Gift box and manicured hand, slow motion. Elderly woman hand with beautiful red polish on nails touching red bow on yellow gift box. Holidays and celebrations concept. Elderly hands with gift box, slow motion. Senior woman hands with elegant red manicure holding yellow gift box with red ribbon, white silk. Holidays and celebrations concept. 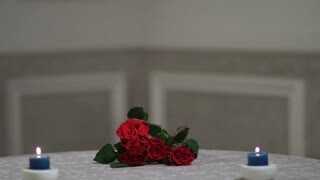 Roses in well-goomed hands, slow motion. Aged woman hands with elegant red manicure holding luxury bouquet of red roses close up. Beautiful gift to elderly woman. Gift box and luxury manicure, slow motion. Old woman hand with beautiful red manicure holding gift box with red bow close up. Birthday gift and anniversary concept.